There’s nothing to be scared of! I don’t understand why this upsets you so much! …and while we certainly don’t mean any harm when we make these statements, few of us realize how unhelpful these phrases really are. You may have seen a meme circling on Facebook recently that says, ‘Never in the history of calming down has anyone calmed down by being told to calm down’, and if you think back to the last time you felt nervous, stressed, or worried about something you perceived as a legitimate threat to you or the ones you love, I’m sure you will agree that none of the statements above would have made you feel comfortable and calm. In fact, when uttered by someone who didn’t understand what you were going through in that given moment, phrases like, ‘don’t worry’, ‘it’s all in your head’, and ‘calm down’ probably would have made you feel worse. Now imagine how it feels to be a child who becomes debilitated with fear over things others don’t understand. It would probably feel pretty overwhelming and scary, right? You’d probably look at your siblings and classmates and wish you could be as carefree as them, and hearing your mom, dad, or teacher say things like, ‘CALM DOWN!’ or ‘Ugh, stop worrying about things you can’t control!’ instead of offering words of encouragement and helping you feel better would probably make you feel really, really lonely. We’ve already shared our best tips for dealing with anxiety in children, and the internet is filled with articles outlining all the things you should never say to an anxious child, and while all of this information is extremely useful in helping us understand anxiety and how we unknowingly contribute to it, what we need is something useful we can say in the moment when our child is struggling to cope. And today I’m going to give you just that. You see, I have struggled with anxiety since I was 9-years-old. There was a time when I was completely debilitated by it, but I grew up in a time where mental illness wasn’t discussed or tolerated, and I was left to figure it out on my own. I managed to overcome my anxiety by the time I was 11, and while it barely played a part in my teenage years and most of my 20s and 30s, it has threatened to swallow me many times since my dad died in 2014. I am familiar with the physical symptoms of anxiety, as well as the lack of control and feelings of loneliness and despair it can cause, and even though I’m able to identify my cognitive distortions and have coping strategies in place to help me calm myself now that I’m an adult, I remember how alone I felt when I was a child. I longed for someone to take me in their arms, tell me they understood how I was feeling, help me find my way back to a place of calm, and remind me that my anxiety over seemingly silly things didn’t make me less of a person. And even though I don’t understand my daughter’s anxiety and often find myself struggling to help her, I hope my experiences with my own irrational fears and the reactions they cause me enable me to better support her. 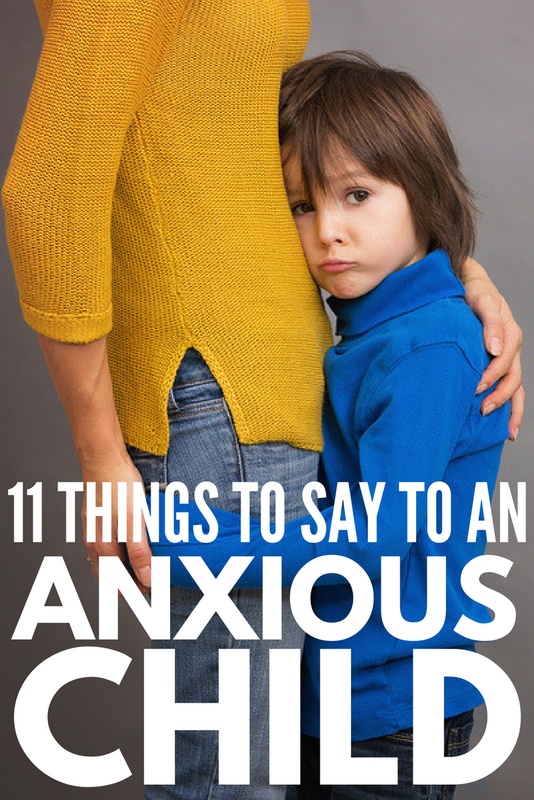 Here are 11 phrases to calm an anxious child I swear by. ‘You are safe.’ From sweaty hands and a pounding heart, to shortness of breath, tummy aches, vomiting, and diarrhea, anxiety can cause a whole slew of physical symptoms, and if you don’t recognize the feelings for what they are, it can be really frightening. If you notice your child struggling with the symptoms of anxiety, a simple reminder that they are safe and that you will stay with them until they feel better can make a world of difference. ‘What you are feeling is called anxiety. Anxiety cannot hurt you, and together we can make it go away.’ Reminding your child that the feelings she is experiencing are anxiety is another great tool to help calm a child. Ask her to describe the feelings she is experiencing, write them down, and pull out the list each time the same feelings crop up as a reminder that these reactions are normal, and that they will eventually go away. ‘Let’s take some deep breaths together.’ It’s no secret that taking deep breaths can help restore a sense of calm when anxiety hits, but when your child’s heart is racing and she feels like she’s going to throw up, her breathing is probably the farthest thing from her mind. Asking her to copy your own deep breathing can help ground her, which will in turn begin to calm the physical symptoms she’s experiencing, helping her feel more in control. ‘I know how it feels to be scared.’ Anxiety can be a very lonely thing, and while I don’t feel it’s overly helpful to pretend you know what someone is going through when you really don’t, telling a child who is experiencing feelings of anxiety that you know what it feels like to be scared can help them feel less alone. Talk about an (age-appropriate) situation that caused you to feel anxious, explain the different symptoms you experienced, and share the strategies you used to calm yourself down. ‘Repeat after me: I CAN DO THIS!’ If your child is experiencing anxiety about an upcoming situation or event, like the first day of school, a test, a presentation, or a social gathering, remind her that she can do it, and then have her yell, ‘I CAN DO THIS!’ over and over while looking in a mirror. Yell with her to get the momentum and excitement going! ‘Can I worry about this for you?’ When my daughter was experiencing anxiety at the beginning of the school year, I had a spur-of-the-moment idea that has been a life-changer for us. Every morning, my daughter and I each put a necklace on, and whenever she feels anxious while we’re apart, she presses on the necklace so she can pass her worries to me. I honestly didn’t think this idea was going to work when I first suggested it, but it has made such a difference that I recommend it to all of my mom friends who need strategies to calm an anxious child! ‘Close your eyes and think of something happy.’ Inspired by an episode of Daniel Tiger’s Neighborhood called Daniel Goes to the Doctor, one of my favorite phrases to calm an anxious child is to say, ‘close your eyes and think of something happy’. It can be a special toy, a person, a vacation destination…anything that creates feelings of joy and happiness to help overcome debilitating fear. ‘What would happen if XYZ occurred?’ Another great tool to help calm an anxious child is to ask her to face her fears. Ask her what would happen if the things she is worried about actually happened. Discuss what that would look like for her and how she could handle it. Ask her to draw a picture and write down some coping strategies she could use so she would feel better able to cope if and when the situation occurs. ‘Let’s go for a walk.’ Exercise has long been known for its positive effects on anxiety, and while it’s not always practical to suggest a period of physical activity the moment anxiety strikes, a simple walk around the neighborhood, up and down the hallways at school, or up and down the stairs at home will offer a distraction when big emotions threaten to take over, while also encouraging proper breathing and helping your child’s body produce feel-good endorphins. ‘What can I do to make you feel better?’ Make sure to ask your child if there’s something you can do to help when anxiety strikes. She may want you to sit with her until she calms down, hold her hand, sing her a song, or give her a hug, but feel too foolish to ask. Remind her that you are her safe place, and that it’s okay to ask for help. ‘I love you.’ The last, but perhaps most important one of my phrases to calm an anxious child is simple: tell your child you love her. Get down on her level, look her in the eye, and say the words she needs to hear. Remind her that her anxiety does not define her, and that it doesn’t change who she is to you or anyone else. There are lots of great age-appropriate books about anxiety you can read with your child as well. Here are 6 of my favorites! The Superkids Activity Guide to Conquering Every Day This super fun kids activity book doubles as a powerful tool to empower kids and help them overcome their worries and fears. It’s written for children, and helps explain the reasoning behind the things they do, while simultaneously giving them the tools and strategies they need to conquer the things they struggle with each day. I highly recommend it! I hope these phrases to calm an anxious child prove helpful to you, and if I can leave you with one more piece of advice when it comes to helping a child with big worries, it’s this: be there for her. Be your child’s safe place, remind her she’s loved, and never, ever give up. If you found this collection of phrases to calm an anxious child helpful, please share this post on Pinterest! And if you’re looking for more parenting tips and tricks, please follow our Parenting board where we share all kinds of great pieces of advice we find each week!